The government of India on Friday allowed companies to hold their yearly general meetings through video conferencing. The facility provides wider extent of participation and cuts additional costs by those who attend board meetings. The Ministry of Corporate Affairs in India said in a statement that companies should send a notice to directors and shareholders regarding their availability to participate on video conferencing. They should also provide important information to facilitate their access to the available video conferencing facility. This is part of the ministry’s Green Initiative Campaign for Corporate Governance. The ministry said that it is a follow-up to the requests they received from different companies to allow participation of shareholders in meetings through electronic mode. MCA added that the secretary and chairman would have to protect the reliability of the meeting, warrant that proper facilities for video conferencing are used, and set-up the time of the meeting and make sure that no one else will attend the meeting other than the involved people. The section 166 of the Companies Act, 1956 requires companies to hold their AGM meetings at its registered office or a location within the village, town or village where the company’s registered office is situated. Public companies should have at least five members personally present in the meeting while two members for other kinds of company. 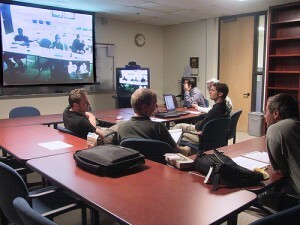 Video conference facility allows people from two or more locations to participate in a meeting and directly communicate with each other. It is widely available in different countries such as Malaysia, Canada and the United States. Sources said final rules regarding video conferencing will be released by the MCA on the next few days.